Brisbane’s warm, dry, breezy inter-season, sprummer, (the period between spring and summer) is intensifying, hastening the production of seed from winter crops. The seed of Ethiopian cabbage (Brassica carinata), Chinese cabbage ‘Tokyo Bekana‘, mizuna, flowering turnip (aka rapini, Brassica rapa var rapa ‘Cima di Rapa Quarantina’) and mustard ‘Osaka Purple’ have already been harvested. I’ve allowed Miner’s Lettuce (Claytonia perfoliata, syn. Montia perfoliata) to self-sow, I’d welcome this as an edible, gap-filling ‘weed’. Coriander and edible chrysanthemum seed are ripening and Italian flat-leaved parsley has started flowering. These three flowers are highly attractive to a variety of beneficial insects. 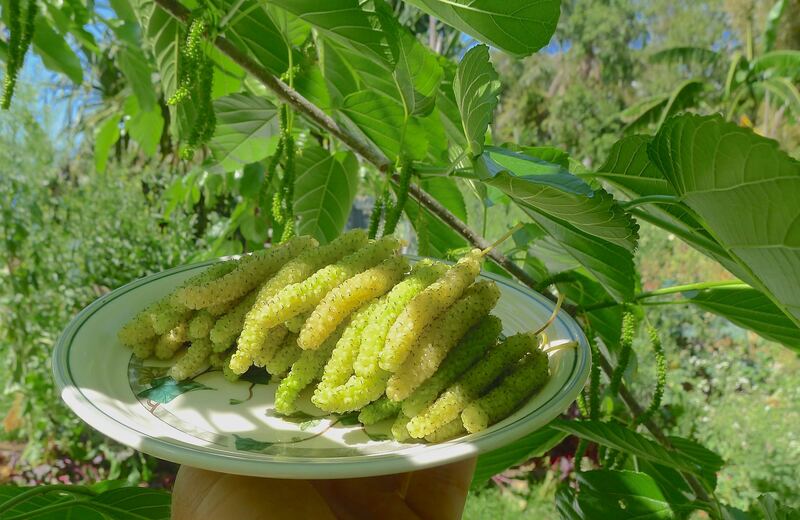 As I water, I help myself to common white mulberry, ‘White Shahtoot‘ (a non-seedy cultivar) and jaboticaba. Jerry I am wondering if you have many blue banded bees at Bellis at the moment, I live in Manly and usually when the Patrea is flowering it attracts lots of these and this year, none, Have you any ideas? There’s no shortage of blue banded bees in my garden. Maybe your bees have found something more to their liking this season. Maybe they have all gone to Bellis, can’t say I blame them, have just planted more blue salvia to try and attract them back!